I wrote this piece in the first issue of YES! Magazine published in early 1997. Maybe even more relevant today? There are times in history when two eras—with their respective world views, cultural patterns, and predominant means of livelihood—run in parallel. One may be exhausting itself while the other is still in its infancy. Early morning at Standing Rock as water protectors build a bridge to Turtle Island. This can be a confusing and divisive time as different sets of cultural assumptions compete to give meaning and direction to life. And the decay of the dying era can seem to overwhelm the formative one. Small actions and choices can have major, although unpredictable, effects in determining what comes next. But these are also times ripe with possibilities. Small actions and choices can have major, although unpredictable, effects in determining what comes next. Among the possibilities is that the thousands of experiments and millions of choices to live more consciously will coalesce into a new civilization that fosters community, provides possibilities for meaning, sustains us while also sustaining life for the planet. Encouraging that process is the purpose of YES! Magazine and its non-profit publisher, Positive Futures Network. A sustainable future is far from preordained. A time of chaos and transition can be terribly frightening and lead to a retreat into simplistic solutions and fundamentalism. Fundamentalism—which can happen on either the Left or the Right, in secular and spiritual realms—is characterized by a rigid belief system and a widening of the polarity between “us” and “them.” Because it is founded in fear and divisiveness, it cannot tolerate diverse views and backgrounds, and is far less capable of creatively discovering answers within a context of complexity. Fundamentalism, which has become all too prevalent in political discourse of late, is not up to the challenges of these times. Instead, the next stage in human evolution will grow out of creative, self-organizing innovations that offer sustainable and meaningful ways of living and interrelating. Like natural evolution, human cultural evolution thrives in a context rich in diversity and complexity, in which there are myriad opportunities for interaction. In such a setting, self-organizing innovation can emerge out of the search for ways of living that sustain us in every sense of the word. These innovations become “attractors” that draw us out of the chaotic soup into further experimentation with sustainable communities, education, new means of livelihood, and new international connections. The most powerful attractors are those that respond to people’s basic needs for survival and to their deepest yearning for such things as connection, meaning, transcendence, and wholeness. When these attractors resonate among large numbers of people, society shifts. An “attractor” can only attract if people are aware of it, however. When people discover voluntary simplicity, sustainable communities, and the many other efforts we write about in YES! they often are surprised and elated to find that they aren’t alone—that they are part of something larger which resonates with their deepest values. The media often ignores these efforts or sees them as blips in an overall downward spiral—when you only see the dying era, things that are full of life appear either irrelevant or poignant. What the media and many others have yet to realize is that these are not anomalies—they are indicators of a much greater dynamic that is allowing us to become whole. And while many of these efforts may now be separate and seemingly unrelated, awareness is growing and connections are developing rapidly. When you only see the dying era, things that are full of life appear either irrelevant or poignant. … These are not anomalies—they are indicators of a much greater dynamic that is allowing us to become whole. The shift that is emerging out of these connections draws on the ancient wisdom traditions that have nourished human souls for eons while also building on the strengths of the modern era and our new global awareness. These complex times are rich with possibilities. Through YES! we raise awareness of the promises and hazards of these times, with news of the ways that people all over are rethinking and re-creating communities, relationships to the natural world, their own sense of purpose and meaning. The Positive Futures Network seeks to help connect people to one another in dialogues that help empower action at all levels. Join us! 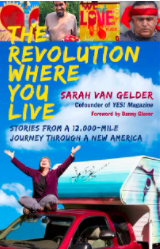 Sarah van Gelder is co-founder and editor-at-large of YES! Magazine. Her new book, The Revolution Where You Live: Stories from a 12,000-Mile Journey Through a New America (Berrett Koehler), launches in 2017. Find out here about her upcoming book tour. Thanks for your blog post this morning. I want to believe what you’re saying. The trouble is I feel like, historically, the forces of greed and powermongering are inevitably more ruthless than the forces of cooperation. They’re more apt to accrue money, power, access to communication channels; they’re willing to lie to achieve their ends. As a result, they tend to “win.” In the bible the meek may inherit the earth but in real life and history, I think it’s the sharks and lions. I’d love to see a column — your blog? in YES!? — that cites historical evidence to the contrary. I’d find that rather encouraging right now. I take your point. This piece was written 20 years ago, and I intended to suggest a possibility, not a probability. I keep looking for and trying to add energy to possibilities, even if they aren’t the most likely outcomes. But who can judge, really, in such complex circumstances. Belief either way can be self-fulfilling. As to your question, I think it would take another book — certainly some serious research. My hunch is that it takes strong cultural restraints to keep the most predatory from winning–for example, religious mandates to share with the poor or Northwest coastal traditions to share via potlatches. Also, the edifices that hold up the power of the 1 percent rely on stability and on our cooperation — and both are tenuous right now. When circumstances shake things up, then it seems to me that things can shift. Previous Post On the road again! Can you help me on my book tour?